Designed for superior, high-rate performance in uninterruptible power supply (UPS) applications, the GNB SPRINTER series offers high power density and reliability. The SPRINTER family of batteries highlights another example of GNB’s extensive experience and world-wide leadership in VRLA technology. 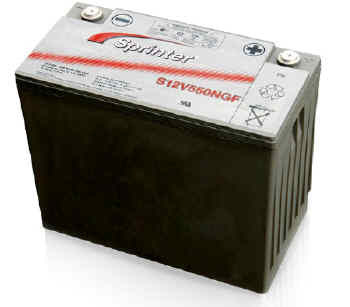 Quality manufacturing processes for the SPRINTER series batteries incorporate the industry’s most advanced technologies including: an automated helium leak detection system, a computer controlled “fill by weight” acid filler, and a temperature controlled water bath formation process. A constant current discharge test is performed on each and every unit prior to shipment. • Optional: Flame-retardant reinforced container and cover compliant with UL94 V-0, 28% L.O.I. SPRINTER series batteries incorporate GNB’s advanced VRLA technology designed for superior high-rate performance in uninterruptible power supply (UPS) and power quality applications.